Whimsy and Parchment... : Book Haul! So, I went to Chapters tonight! I probably should have waited, especially since I think I'd like to pick up a physical copy of 'Shutter' and maybe 'Red Queen' too, later on this month... But oh well, I went anyway! Considering that I spent an hour there, wandering around, I think just three books is pretty good. So, The Way Of Kings was one that I was intending to purchase. I have it on my Kobo but for such a big book I thought having the physical book and being able to see my progress would be good. I almost bought the larger paperback version that has illustrations, but in the end I decided against it because I wasn't sure if I'd actually carry that with me (and carrying may be involved if I take it to work with me). So wish me luck with this one, it's a monster of a book so it's going to take me awhile! Then The Blade Itself caught my eye because it was at the end of an aisle... That and the cover, which has that fantasy-esque look that's guaranteed to get my attention. It has good reviews from my GR buddies so I'm hoping that it'll be good! Then lastly is Origin, which happened to be on sale for $6. The cover is beautiful and again, good reviews from my GR buddies! Avid and passionate reader. Aspiring writer. Addicted to fantasy. 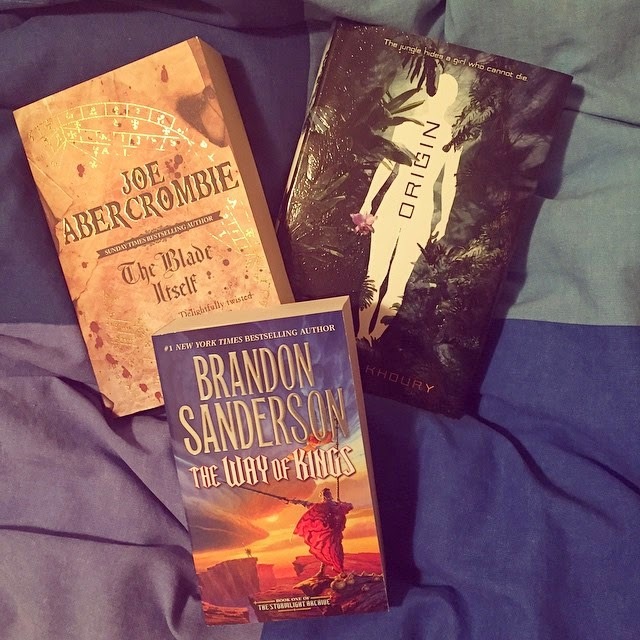 I read science fiction, fantasy, thrillers, romance and horror, with quests now and then into non-fiction. I love getting to know new people and seeing what books we both love!